Amazon Echo Show announced with 7" touchscreen and 5MP camera. Today Amazon announce the launch of a new product called the Echo Show. Echo Show brings you everything you love about Alexa, and now she can show you things. Watch video flash briefings and YouTube, see music lyrics, security cameras, photos, weather forecasts, to-do and shopping lists, and more. All hands-free-just ask. Echo Show has eight microphones and beam-forming technology so it can hear you from across the room-even while music is playing. Echo Show is also an expertly tuned speaker that can fill any room with immersive audio powered by Dolby. When you want to use Echo Show, just say the wake word "Alexa" and Echo Show responds instantly. Voice responses from Alexa are now enhanced with visuals and optimized for visibility across the room. Call or message your family and friends that also have an Echo or the Alexa App, get the news with a video flash briefing, see your Prime Photos, shop with your voice, see lyrics with Amazon Music, and more. All you have to do is ask. Equipped with eight microphones, beam-forming technology, and noise cancellation, Echo Show hears you from any direction–even while music is playing. When you want to use Echo Show, simply say the wake word, "Alexa" and Echo Show lights up and streams audio to the cloud. The Alexa Voice Service is then leveraged to recognize and respond to your request instantly. If you have more than one Echo Show, Echo, or Echo Dot, Alexa responds from the Echo you're closest to. If you want to limit your interaction with Alexa, simply turn the mic/camera button off. Learn more about voice recognition on Echo Show. Use Echo Show to see a live camera feed from the nursery or your front door. Turn on the fan or dim the lights from the couch-all without lifting a finger. Echo Show works with smart home devices such as cameras, lights, fans, thermostats, garages, sprinklers, and more. Learn more about compatible smart home connected devices, including starter kits for easy setup from brands such as Ring, WeMo, Philips Hue, SmartThings, ecobee, Wink, and others. 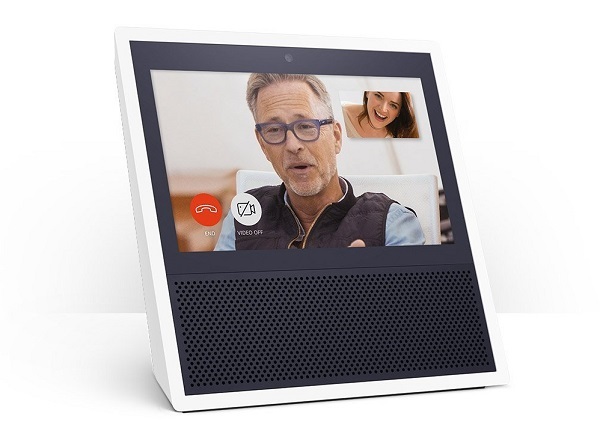 + Make hands-free video calls to friends and family who have an Echo Show or the Alexa App, and make voice calls to anyone who has an Echo or Echo Dot. + See lyrics on-screen with Amazon Music. Just ask to play a song, artist or genre, and stream over Wi-Fi. Also, stream music on Pandora, Spotify, TuneIn, iHeartRadio, and more. + Ask Alexa to show you the front door or monitor the baby's room with compatible cameras from Ring and Arlo. Turn on lights, control thermostats and more with WeMo, Philips Hue, ecobee, and other compatible smart home devices. Wi-Fi Connectivity: Dual-band Wi-Fi supports 802.11 a/b/g/n (2.4 and 5 GHz) networks. Does not support connecting to ad-hoc (or peer-to-peer) Wi-Fi networks. Bluetooth Connectivity: Advanced Audio Distribution Profile (A2DP) support for audio streaming from your mobile device to Echo Show or from Echo Show to your Bluetooth speaker. Audio/Video Remote Control Profile (AVRCP) for voice control of connected mobile devices. Hands-free voice control is not supported for Mac OS X devices. Bluetooth speakers requiring PIN codes are not supported. Alexa App: The Alexa App is compatible with Fire OS, Android, and iOS devices. Amazon's Echo Show is priced at $229.99.